A special thank you to Hallmark for sponsoring this post! Mother's Day is a great holiday to remind your mom how much you love her! Don't stop after Mother's Day though, she needs to hear it often! I am a mother of two really great kids. I am a wife to a wonderful husband. I am a daughter to a mother that has passed and a father that lives on as happy as possible. Around Mother's Day it's a great reminder of what I am to people. Along with these great roles, I take pride in being a friend. I have spoken many times about the wonderful friends I have. We've known each other since grade school. Lucky for all of us, being a mother is something we haven't had to fight with. Each have children of different ages, shapes and attitudes! These factors have made us into different types of moms, so when I get a chance to say "Great Job!" or "Keep it up!" I hop right on it. This Mother's Day I am sending out Hallmark cards with love! 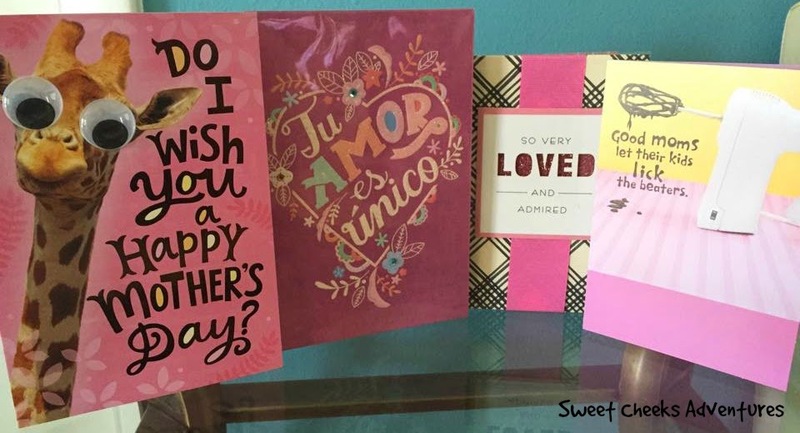 This year Hallmark has some really great options for you to send your Mothers, Grandmothers, and Friends! Check out a few of my favorites. You see Wonder Woman right there? Yeah, that card is perfect for me! Ha! No really. Queen of hearts and the other option with the beautiful wooden necklace are perfect! I know exactly who they will be going to this year. Oh my goodness, look at those eyes!!! My husband has chosen who these 4 cards will be sent to. Cooper wants to keep the Giraffe for himself! To top off this great collection, my mom always let me lick the beaters! So tasty! Sometimes you need to send a card to your grandmother. Without her, you wouldn't be around.. Think about it! So, send a card to your grandma! It'll brighten her day in a Hallmark kind of way! 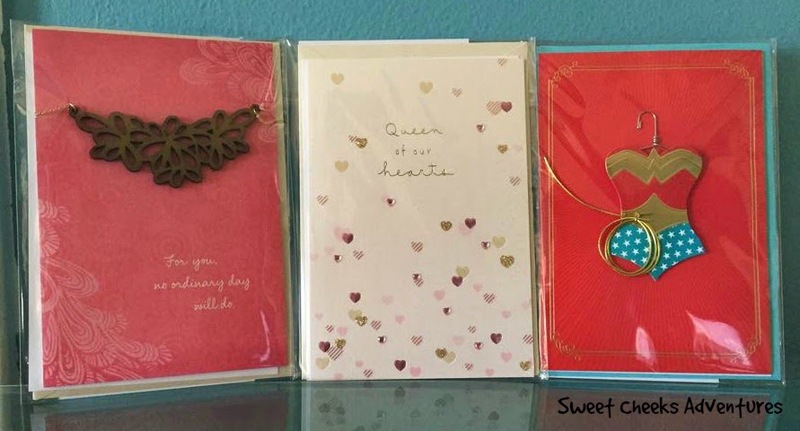 Did you see a few cards that you will be hunting for at your local Hallmark store? I have a SURPRISE for you, I have a five pack of cards to giveaway for one lucky reader! Keep scrolling! Dates: Starts April 29, 2015 5:00 pm EST. Winner will be chosen May 5, 2015 11:59 pm EST. 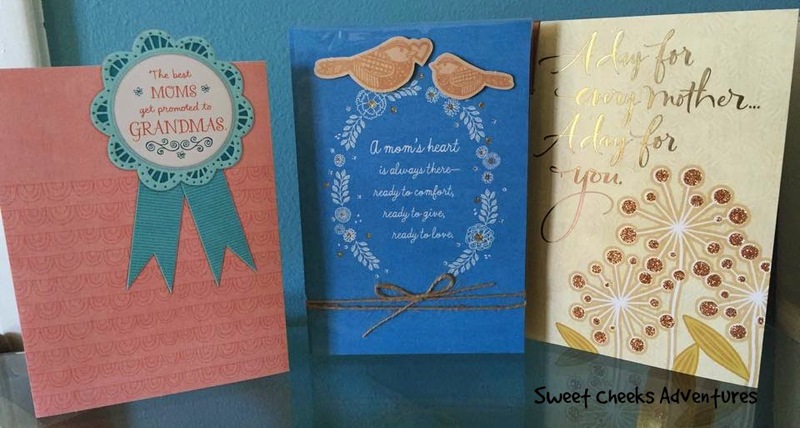 Disclosure: Sweet Cheeks Adventures teamed up with Hallmark for this giveaway. Other participating bloggers are not responsible for choosing the winner or shipment of product. They have not receive any compensation for this post. This giveaway is in no way associated with Facebook, Twitter, or Pinterest. The winner will be chose at random by the Giveaway Tool and emailed. The winner must claim the prize within 48 hours or they risk forfeiting the prize. We were at Church, my so was about 10. Each Mom & child were asked to come to the front to receive a rose. Most of the children just handed the flower to their Mom and hugged them. My son handed me the rose and said, "Thanks, Mom, for taking me to baseball games and all the stuff you do!" I was so proud that he was able to speak out in front of the whole congregation. He still has his out-going personality! 21 years later! I feel like Hallmark has really stepped up their game in their cards -- they have a lot of fun and pretty options! My mom has always shone such love for me. I'm a grown up now but forever her baby. I love Hallmark Cards. They have a card for everyone and they are priced great. I love Hallmark! Sadly I won't be sending my mom a card, but I will be sending one to my moms BFF! Hallmark of course! I love hallmark, they have wonderful cards perfect for an event; I shop there quite a lot! I have always loved Hallmark cards. I have often wondered if sending cards is still something people really do but there are still lots of card options in the stores so it seems people are. It's nice to get a card especially if you are going through a tough time. I love Hallmark! I hope my kids will get me some of these great cards for Mother's Day! I always get Hallmark cards! They are the best! I always buy Hallmark Cards. They're my go to when I need a heartfelt sentiment but I'm having a hard time coming up with anything to say! Just add a simple note and you're good! We just love to shop at Hallmark for cards and gifts for mom (and all other occasions too!) We can always find something there, even for the hardest person to buy for! Having my mother and both of my grandmother's here and we visited with them all together at my one grandmother's house for a nice meal on Mother's Day. I love everything about Hallmark. Their Christmas decorations, their movies and especially their cards. The cards have the best messages. My mom, grandmother, and myself went to bingo all of the time. When my mom and I went shopping on the day after Thanksgiving ! My first Mother's Day as a mother will always be special. I have lots of special memories of time spent with my mother. Some of my best memories are at Christmas time. I am most excited about the tote bag. Giving my mom a memory basket one year. I just found out she kept all the strips of paper that I made up with memories of the 3 of us growing up mainly funny stuff my brother sister and I did, like plastic spiders in the bed when we got home from a date, or vacation memories. I'm was tickled to know she kept and treasured them.